The Sequel to Boundary. Space Adventure by a New York Times Best-Selling Author and a New Star of Science Fiction. When the strange fossil she'd discovered had ended up giving her a trip to Mars, Helen Sutter thought she'd gone about as far as any paleontologist would ever go in her lifetime. But when you've also married A.J. Baker, overconfident super- sensor expert for the only private agency in space - the Ares Corporation -- and your best friend Madeline Fathom Buckley is a former secret agent who's just signed on as the chief of security for the newly created and already embattled Interplanetary Research Institute of the United Nations, there's always somewhere farther to go. The newest discoveries will take her, A.J., and their friends Jackie, Joe, and Madeline to the mysterious asteroid Ceres - and beyond, in a desperate race to Jupiter's perilous miniature system of radiation- bombarded moons. The next gold rush is on - for alien technology, hidden in lost bases around the system. And there are people willing to do anything to get it - even plan the first interplanetary war, four hundred million miles from home. Eric Flint is the author/creator of the New York Times best-selling Ring of Fire series, the most popular alternate history series today. With David Drake he has written six popular novels in the Belisarius series, and with David Weber collaborated on 1633, and 1634: The Baltic War, two novels in the Ring of Fire series, and on Crown of Slaves, a best of the year pick by Publishers Weekly, and its sequel, Torch of Freedom. Flint received his masters degree in history from UCLA and was for many years a labor union activist. He lives in East Chicago, IL, with his wife and is working on more books in the best-selling Ring of Fire series. Ryk E. Spoor, while earning his masters degree in Pittsburgh, became a playtesting consultant and writer for the Wizards of the Coast, the leading publisher of role-playing games and related novels. He now lives in East Greenbush, NY, working as a technical proposal writer for a high-tech R&D firm, and spending his non-writing time with his wife and sons. 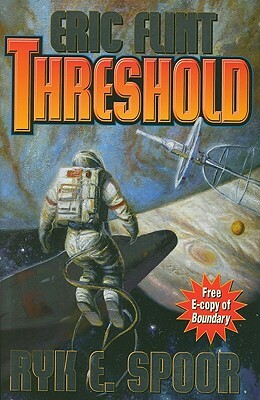 Baen published his first novel, Digital Knight, in 2003.